This is a fabulous natural glove, tanned cowhide briefcase/laptop bag. It is stamped made in the USA. Crossbody Briefcase Bag. 12.5"L x 10"H x 4"W.
Excellent condition. Coach bags were made to last! This looks to be an early city bag. full length pocket under front flap and an inside zippered pocket. sturdy brass turn lock closure. I look over everything very carefully. 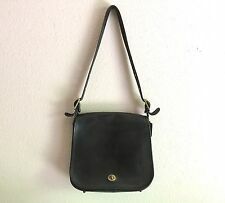 For your consideration, a vintage Bonnie Cashin Coach black leather twist lock saddlebag handbag, circa late 1960s NYC. Good condition with mild wear and minimal scuffing and staining. Some wear to piping on the back noted in photos. Interior is extremely clean. One zipper pocket in good working order and two pockets under the flap. Bag measures 11 inches in length, 10 inches in height, and 4 inches in profile depth. Strap is adjustable, currently 14 inch drop. Noticeable if you look carefully and cannot be seen at all when the bag is closed and being carried. The interior suede is unblemished and is in 'like new' condition. It is soft and supple and the red is rich and vibrant. Outside Large Pocket with Snap Closure. Here's a slim and sturdy Coach briefcase from the early 80s. Dallas in the 80s was really formal. Used it for about four or five years until I was promoted to manager of field operations. It was way too formal to carry in the desert. 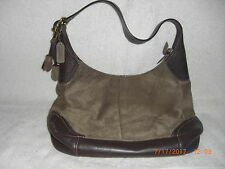 This is a nice preowned Coach leather handbag. There is still a lot of wear left in this one;. I will attempt to correct any and all problems with your order but I can not help you if I do not know about it. Zippered top closure. 3 interior pockets and one zippered interior pocket. One exterior pocket. Interior Black Suede. Exterior Slip pocket Front of bag. Shoulder Strap has 22" drop. Brass Fittings/Zipper Closure. Shoulder Strap Lift: 24". Height: 8". 3 separate inner pockets. Coach Hampton Black Leather Hobo Flap Handbag, #7583. Closure is buckled flap with snap. 1 zippered pocket and two open pockets inside. Large external pocket on Back. IT IS THE ORIGINAL LEATHER INTERIOR STYLE BUCKET COACH. THE COACH LOGO IS EMBOSSED ON THE INSIDE POCKET, BUT I CANNOT QUITE MAKE OUT THE SERIAL NUMBER. THIS ALL LEATHER INSIDE AND OUTSIDE PURSE COULD USE A GOOD BUFFING! What You See On The Pictures Is What You Get.